Southeast Colorado's premier art gallery. Be sure to stop in and see all the new artwork on display in the Galaxy Gallery! Travis K. Walker is originally from Coffeyville in southeastern Kansas and currently resides in Wiley. Travis’s interest in photography has been building over time and is an important creative outlet and expression of faith for him. His photographic interests are primarily wildlife (especially birds), landscapes, and other parts of life as they come. Travis enjoys living in southeast Colorado with the rich diversity of migratory and resident birds, open landscapes, and history. Travis’s online portfolio can be found at http://traviskwalker.myportfolio.com and on Instagram @rev_traviskwalker. Shop fine art online here, not all items available online. 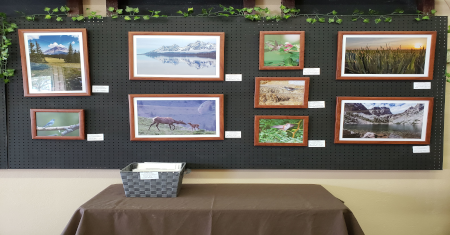 Come visit the gallery to see more fine art from Southeast Colorado. Check the Gallery Blog page for Galaxy Gallery updates and news. RCM Consulting & Consignment LLC is a business that provides marketing advice to some of the most innovative and emerging companies in communities of Southeast Colorado.